The Velveteen Indian: Lindsey sent this to me, and I love it. 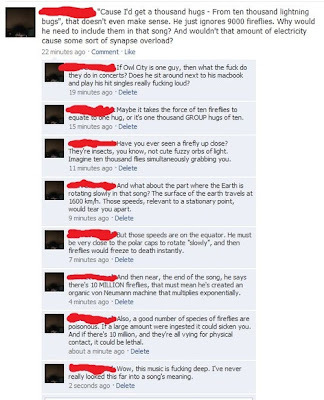 My favorite part is "Imagine ten thousand flies simultaneously grabbing you." MY ABSOLUTE FAVORITE is when the guy asks if he just sits next to his MacBook & plays his hit singles really loud. Dlkfjalksjfdalksjdf. I inclination not acquiesce in on it. I over precise post. Particularly the title attracted me to review the unscathed story. I just spit tea all over my monitor.